Best of the Week: Spotify Now, new Yamaha products, Samsung 4K TV review | What Hi-Fi? A round-up of the news and reviews that have graced What Hi-Fi? 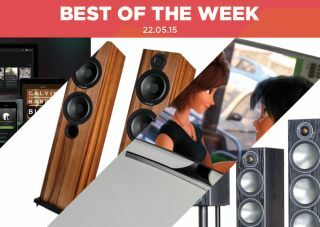 this past week – featuring products from Monitor Audio, Onkyo, Samsung and Yamaha. This week Spotify announced new features for its Spotify Now app as it expanded its horizons beyond music streaming. Elsewhere Monitor Audio and Yamaha showed off their latest wares, the former revealed its Bronze series of speakers and the latter took the covers off its 2015 range of AV receivers and hi-fi separates. It was a five-star week on the review front, with the Samsung UE55JS8500 4K TV continuing the Korean manufacturer's strong run of form. There's an Aero 6 floorstander from Cambridge Audio that more than holds its own in the budget area and the excellent value A-9010 stereo amp from Onkyo. Spotify has expanded its content to include news bulletins, music videos and podcasts. It follows rivals Deezer and Tidal's moves into delivering complementary audio and video content, with the BBC, MTV, Vice News and several other media partners onboard. At a launch event in New York, the streaming giant also introduced two new features: Spotify Running and Spotify Originals. The former serves up music suited to your workout, while the latter showcases exclusive tracks and 'curated radio shows'. If you live in the UK, US, Germany or Sweden and have access to the iPhone app, these features should be up and running soon. Other markets and platforms will receive the new features in due course. Earlier this year Monitor Audio unveiled its new Gold series of speakers and now it's taken the covers off its Bronze range. The range consists of standmount, floorstander, centre, surround and subwoofer speakers - but no sign of a Dolby Atmos speaker. These speakers boast Monitor Audio's latest HiVe II port technology cherry-picked from the Gold range for improved bass response, as well as C-CAM drivers, which Monitor Audio claims results in better power handling and optimal performance at all volume levels. For more on the Bronze range click below. Yamaha has taken the covers off its 2015 range of AV receivers and hi-fi separates, which should be trickling into shops soon. The new line-up of AV receivers will consist of five new efforts: the RX-V379, RX-V479, RX-V579, RX-V679 and the RX-V779. The RX-V379 (£300) comes in as the budget option, the RX-V579 (£500) slots in the middle, while the RX-V779 (£700) sits at the top. All of them come with wireless capability (for the first time) but none will have Dolby Atmos functionality. Expect Yamaha's pricier AV receivers to have that. Elsewhere Yamaha has launched two hi-fi components: the A-S1100 integrated stereo amp and a re-release of the CD-S1000 CD player. They'll both be available sometime in the summer. Apple set to enter the Ultra HD TV market... or is it? "Samsung UE55JS8500 is a dream to use"
We have yet another 4K TV from Samsung on our hands - and like the previous one, it does not disappoint. The biggest talking point is the display. Using Samsung's own take on nano-crystal technology – a thin layer of crystals that emit light – the resulting picture is very impressive. Whether it's dealing with content in 4K, HD, or standard definition, the picture is detailed and blessed with faithful colour reproduction. It's another stunning effort that carries on the company's strong run. The UE55JS8500 is a pleasure to use. "You get a great deal of tech for your money here"
The Aero 6s used to cost £650, but a price cut has brought them down to £400. We're struggling to think of a better bargain at that price. Part of the award-winning Aero 5.1 package, they've now split from the group (not permanently, of course) and are pursuing a hi-fi career as a solo act. For £400 they offer an expansive soundstage; music reproduction that's full of insight, enthusiasm and control that makes them a joy to listen to. Problems? They're not the most agile when it comes to bass and they take up a bit of space. Minor quibbles aside, these Cambridge Audios are very impressive floorstanders. "Start listening and it doesn’t take long to realise that the engineers have managed to deliver something special." Although Onkyo is better-known for its AV receivers, the C-N7050 CD player and hi-res streamer challenged that perception. The A-9010 confirms Onkyo's diversification with a stereo amplifier that offers excellent value. Despite its basic appearance, the listening experience gets the ears twitching. The A-9010 serves up a performance that's well balanced and consistent across differing musical styles, and we've not heard such a musically captivating stereo amp in the budget arena for some time. Build a system around it (with similarly priced kit) and you won't regret it. Terrific!